Another abstracted landscape, this time based on a visit to the Fortingall group of standing stones in Perthshire. Originally comprising many more stones, thought to be deliberately pushed over in the 19th Century, visiting this site invites many thoughts about what it means to be rooted in time and place and what happens when we become dislocated. This composite piece was inspired by my attendance at a dance and art course on the Isle of Mull in mid 2018. 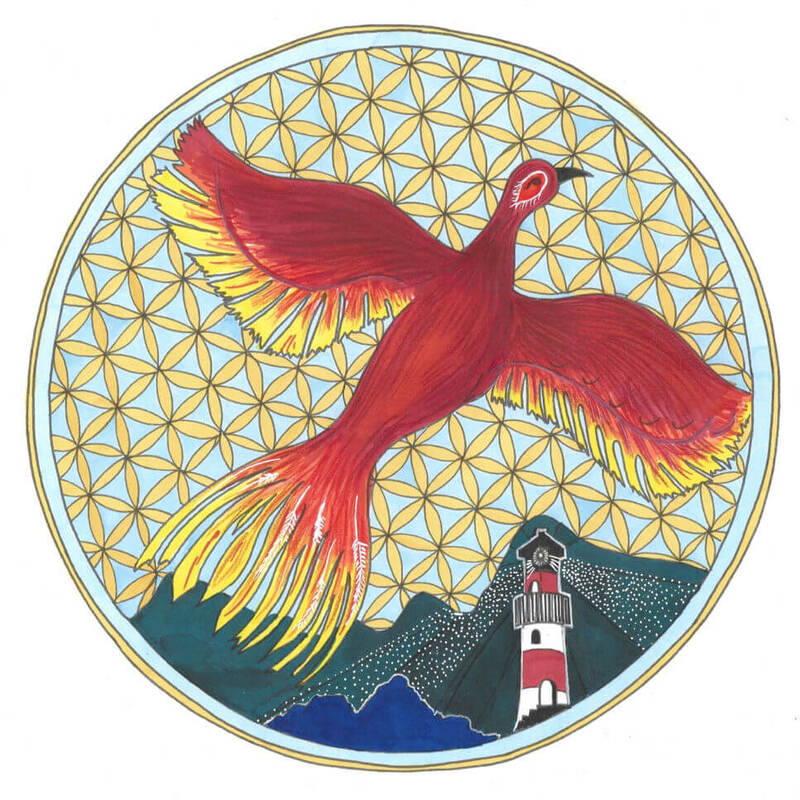 Throughout the Mandala Days programme, I have been drawn to creating the ‘flower of life’ pattern and it feels like a fitting background to the phoenix, mountains and lighthouse that frequent this image. 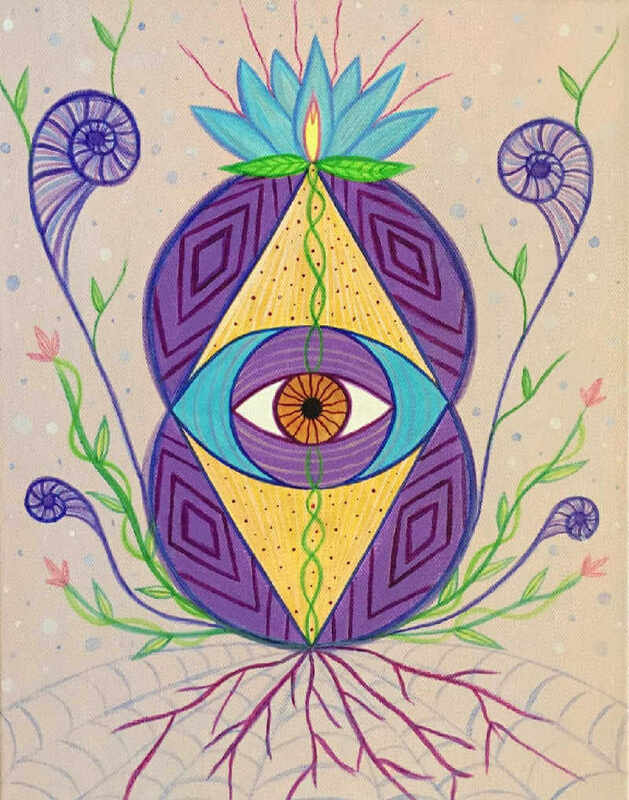 An expression of the unity and connection underlying all. Just like that; I saw the sound of the growing sunlight move through those trees in a pulsating movement of wild colors. Colorful and free, waves of sound, flowing and playing in the woods at sunrise. 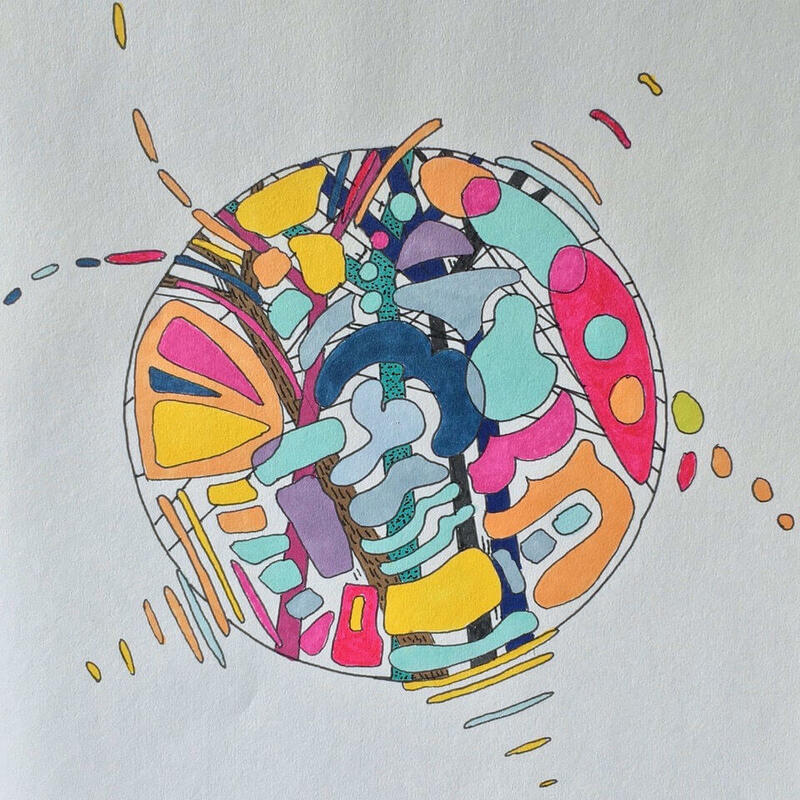 The sound colors danced; expanding and folding back on themselves, then expanding again. So, I laid those sounds down in a mandala but they would not stay still within the circle and instead, danced on. 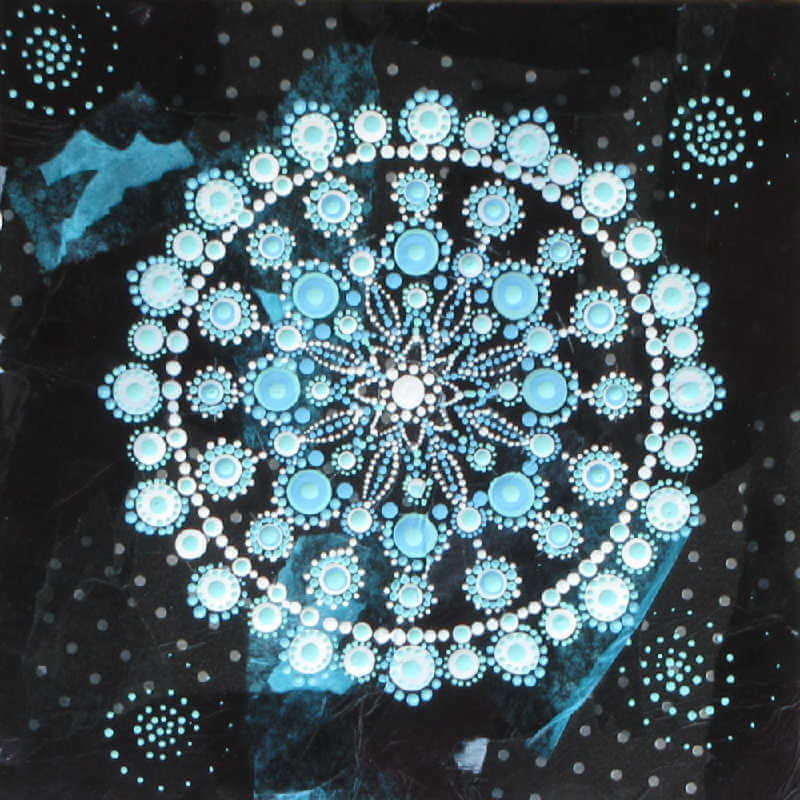 The inspiration for this mandala came from a monthly challenge from Julie Gibbons’ year-long “Mandala Days”. 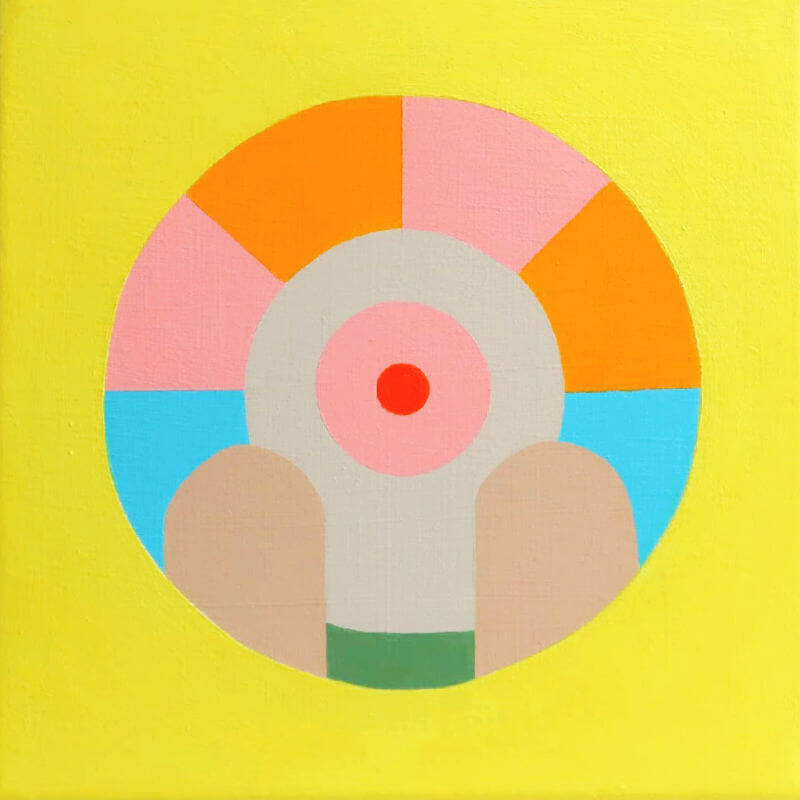 It combines the jovial curves and colors of the Earth, the Moon and the Sun. Everything in life is made up of energy including colours, shapes and forms. Energy as frequency can be expressed as numbers. Numbers can be expressed in shape and form. 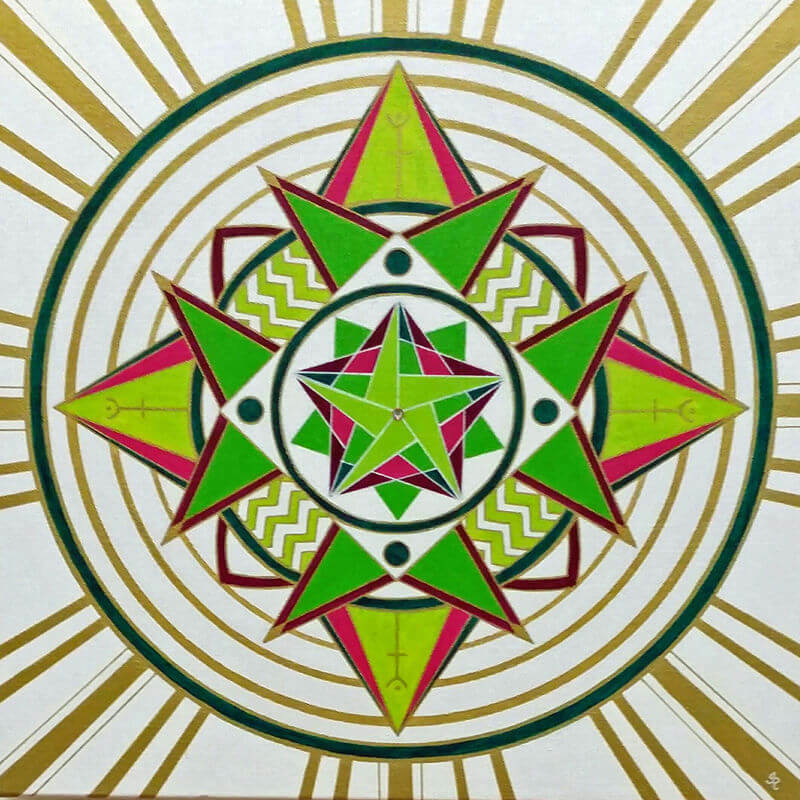 Include colour with shapes and forms in a mandala and you have a powerful vibrational “medicine” that reaches all levels – physical, mental, emotional and spiritual. 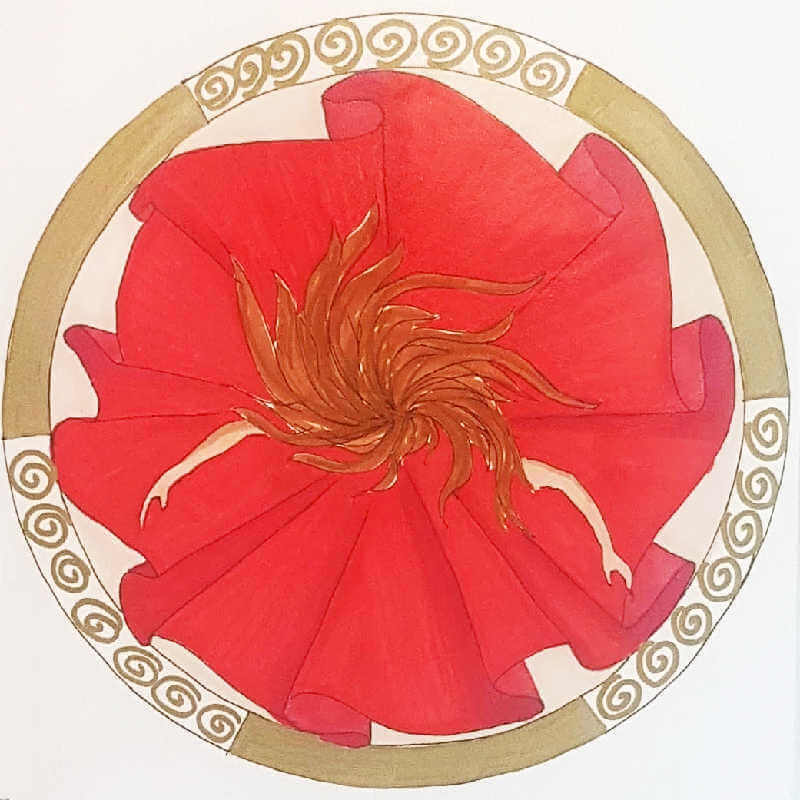 Swirling from inside to out and outside in, finding space to move freely whilst maintaining contact with centre. Fine lines of protection that offer gentle holding, and yet allow movement outwards. Rich rose gold and purple symbolising the preciousness of that which must be protected. 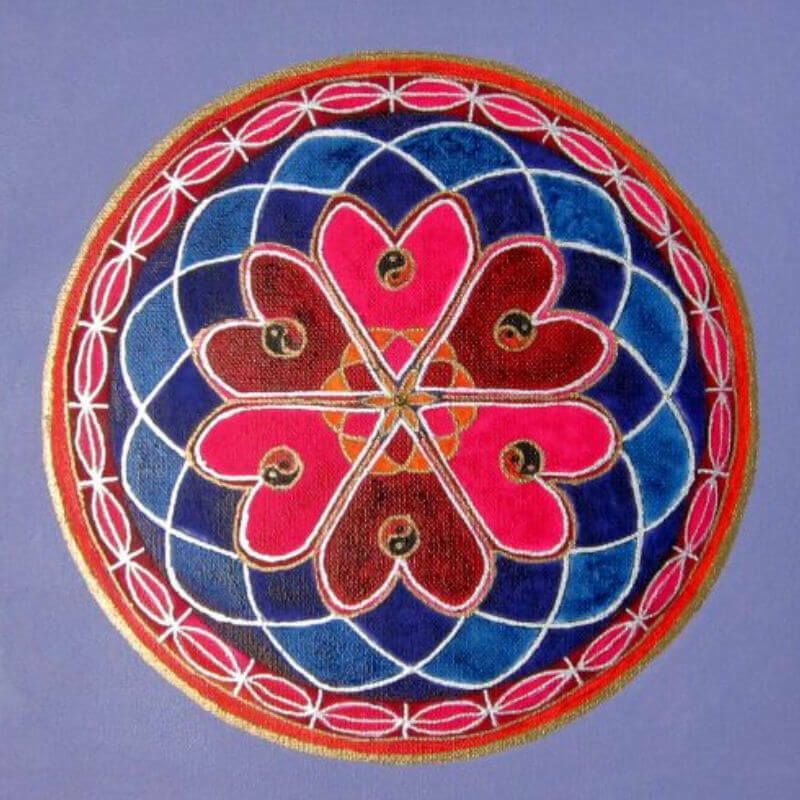 This mandala shows the rich work done in our dreams. The black cauldron holds so much wealth, but it must first be interpreted and assimilated. Our dreams tell us stories that can be frightening, but perhaps that is only to get our attention. They actually shine light on our true colors and help us integrate and weave such wisdom into our lives for our greater good. 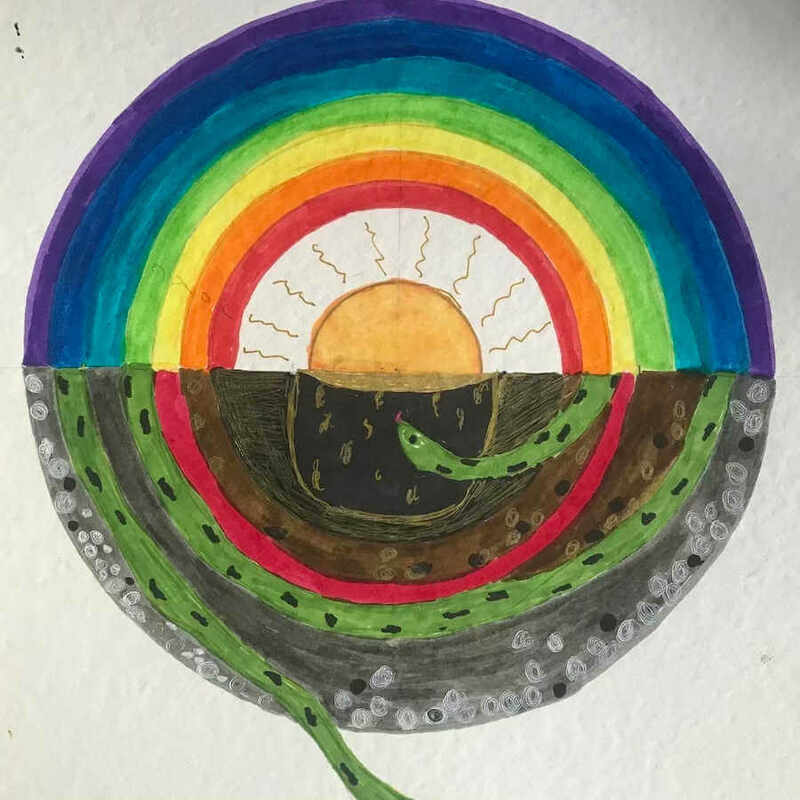 The snake is a mechanism of transformation. An actual tracing of my hand was used as the basis of this mandala. 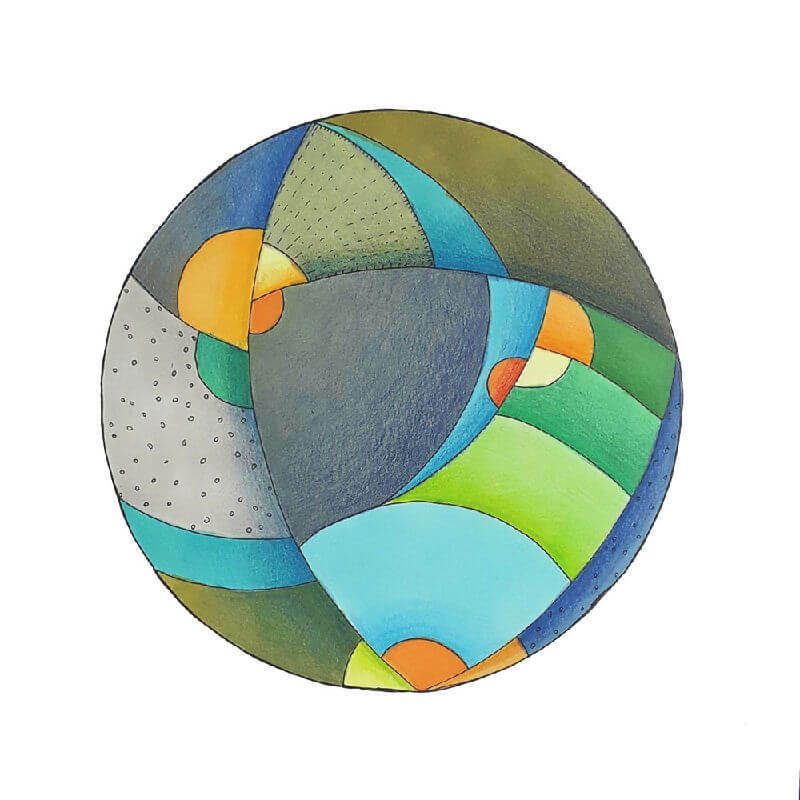 The layers colours used here echo some of those of my first mandala in this series, and give a sense of personal aura or life-force energy radiating outwards. 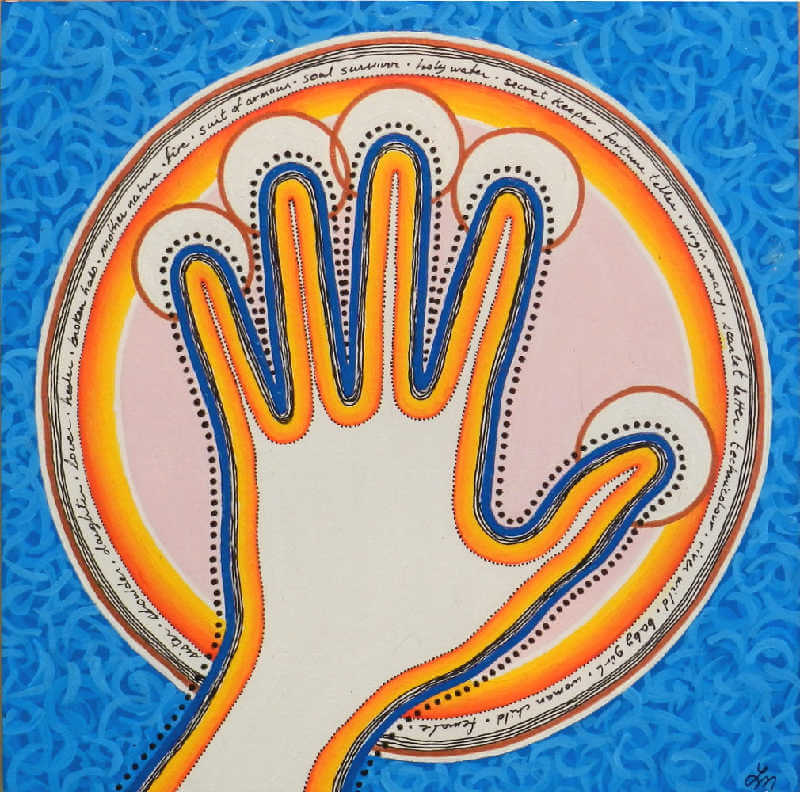 The hand is reaching in from outside the frame of the painting, making contact with the magic of the mandala form. Note: the words written around the circumference of the mandala are from the song “Female” by Keith Urban. 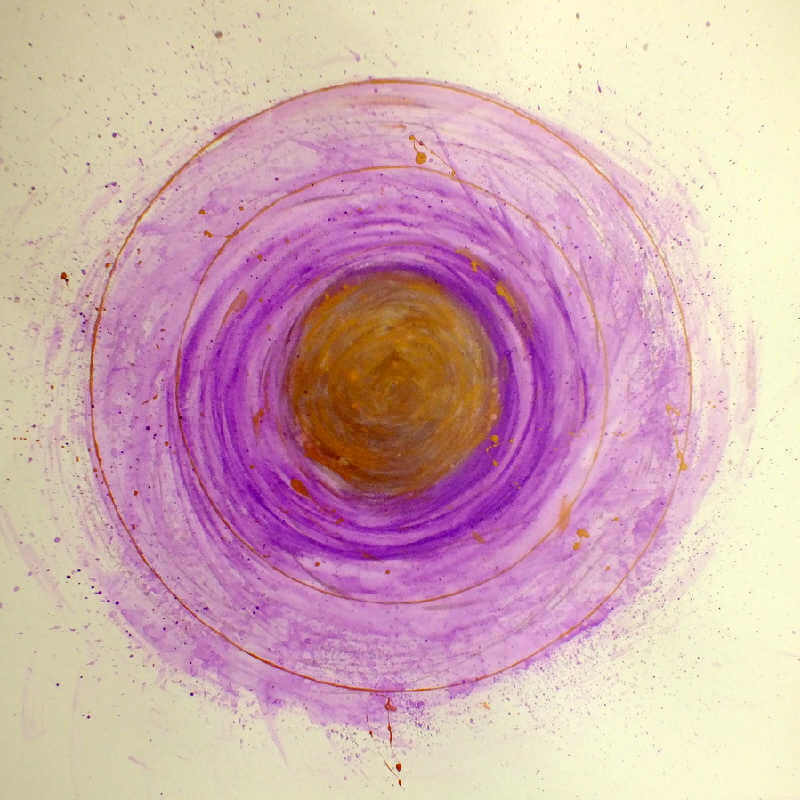 This arose from a meditation in which I felt myself drawn into a wild spiral dance. The wild energy arose spontaneously from within and created this image. It represents my wild and free and joyous aspect which is seeking greater expression in the world.